The lucky pooch was spotted by a British coastguard helicopter which was on a training exercise off the coast of Scotland. An "exhausted and wet" pet dog was dramatically rescued after being swept out to sea on Sunday. The lucky pooch was spotted by a British coastguard helicopter which was on a training exercise off the coast of Scotland. 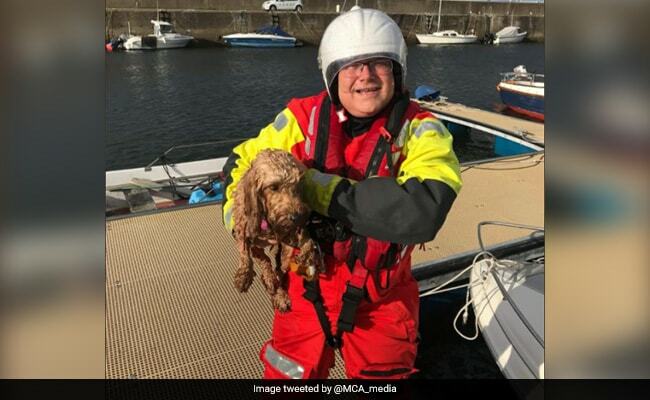 The Maritime and Coastguard Agency received a frantic call reporting that a Cockerpoo - a mixed-breed dog that is the cross between a Cocker Spaniel and a poodle - had been swept out to sea. A Coastguard helicopter, which was training in the area at the time, was quickly able to locate the tiny dog. Rescue crew in the chopper kept their eyes on the pooch until a lifeboat was able to pull the dog on board. The dog was returned it to its owners, who were anxiously waiting on shore. The rescue prompted plenty of praise from Twitterati. "Lifeboats save many, many lives every year and I'm sure families of furry kin are grateful and relieved for the help," commented one person. "That's one soggy doggy! Well done team. Great to know there are good people like you there for us all," commented another.